Every year, Cressida’s family spent four weeks of the summer, and two weeks of the spring, on the island. The family had to catch their own fish to eat. The house was lit by candle-light, and there was no telephone or television, so Cressida spent her time drawing and writing stories. In the evening, Cressida’s father read the children tales of the Vikings, who had invaded this island Archipelago over half a millennium before, of the quarrelsome Tribes who fought and tricked each other, and of legendary dragons who were supposed to live in the caves in the cliffs. This was how Cressida herself first began to write stories about Vikings and dragons, back when she was eight or nine years old. Many years later, she turned her original childhood ideas into the book How to Train Your Dragon, featuring Hiccup the reluctant Viking, and his equally reluctant dragon, Toothless. Cressida wrote and illustrated her first picture book, Little Bo Peep’s Library Book, for Hodder Children’s Books in 1998. Her first novel for eight to twelve year olds, How to Train Your Dragon, was published to popular and critical acclaim in 2003: ‘The next big thing in children’s literature,’ wrote The Independent on Sunday. ‘Irresistibly funny, exciting and endearing,’ said The Times. How to Train Your Dragon has now been published in over thirty languages. Film rights were sold to DreamWorks Animation in 2003 for a substantial sum and the filmed version was released into cinemas in March 2010. The 3D animated film from the studio that created Shrek, Madagascar and Kung Fu Panda, was directed by Chris Sanders and Dean DeBlois (the directors of Lilo and Stich) and produced by Bonnie Arnold (who produced Toy Story). * My top writing tip would be to read lots, to give you a feel for the way different stories can be told. Also practise writing as much as you can – write, and re-write – don’t worry if you don’t finish a story, as long as you are practising, that’s what matters. Also don’t worry if your stories aren’t very long: I didn’t start out writing books as long as the ones I write now. * You can still do research when you are creating your own fantasy world. Kids often think that ideas get beamed into an author’s head, or that when you write fantasy you can’t do background reading, but many ideas in The Wizards of Once were sparked by books I read about the history of magic, and magical creatures. * You can be inspired by your own experiences. Ideas I had about Vikings and dragons during summer holidays when I was 9 years old became 12 books, and a film and TV series. I had a slightly unusual childhood (I spent my summers on an uninhabited Scottish Island), but the world we all live in is full of extraordinary, wonderful idea for stories. You only have to watch an episode of Blue Planet to see that’s true. * I always begin my stories with a map of my imaginary place. Lots of other authors have done the same – Robert Louis Stevenson drew a map of Treasure Island before starting to write. This is a really easy way of thinking about characters and setting. * Often kids say to be that they aren’t very good at writing, but I know that’s not true – what they’re struggling with is the mechanics of getting the words onto paper. If you can make up a game in the playground, or you tell your friends stories, you can be an author! Get an adult to write or type for you, if you need to. * Keep an ideas notebook so you can scribble down ideas and drawings. This doesn’t need to be neat, and no one should be correcting it for spelling, because spelling doesn’t matter. I kept an sketchbook for The Wizards of Once for about 5 years. Dragons vs Humans: is this the end? Find out in the twelfth book in the How to Train Your Dragon series. It is the Doomsday of Yule. At the end of this day, either the humans or the dragons will face extinction. Alvin the Treacherous is about to be crowned the King of the Wilderwest on the island of Tomorrow. His reign of terror will begin with the destruction of dragons everywhere. The fate of the dragon world lies in the hands of one young boy as he stands on the nearby isle of Hero's End with nothing to show, but everything to fight for. Hiccup Horrendous Haddock the Third's Quest is clear. First he must defeat the Dragon Guardians of Tomorrow and prove that he is in fact the rightful king, even though Hiccup has none of the King's Things and Alvin the Treacherous has all ten of them. And then he faces his final battle: Hiccup must fight the Dragon Furious and end the Rebellion ...ALONE. As Doomsday draws to an end can Hiccup be the Hero of the hour? Will the dragons survive? How to Train Your Dragon is now a major DreamWorks franchise. How to Train Your Dragon 3 is scheduled for 2017 starring Cate Blanchett and Jonah Hill and the TV series, Defenders of Berk, can be seen on CBBC and Netflix. Read all of Hiccup's exploits in the series: How to Train Your Dragon, How to Be a Pirate, How to Speak Dragonese, How to Cheat a Dragon's Curse, How to Twist a Dragon's Tale, A Hero's Guide to Deadly Dragons, How to Ride a Dragon's Storm, How to Break a Dragon's Heart, How to Steal a Dragon's Sword, How to Seize a Dragon's Jewel and How to Betray a Dragon's Hero. Check out the brilliant website at www.howtotrainyourdragonbooks.com It's the place to go for games, downloads, activities and sneak peeks! Emily Brown and her old grey rabbit were an instant hit with children and parents everywhere when they burst onto the scene and won the 2006 Nestle prize. The book was called That Rabbit belongs to Emily Brown. Here is their second adventure is reissued in paperback and once again they save the day by making someone happy. By the bestselling author of the How to Train Your Dragon series comes a reissue of the classic tale of Emily Brown and her old grey rabbit called Stanley. Emily Brown’s toy rabbit is so charming that the queen decides that she wants it to! But, Emily isn’t prepared to give her rabbit to anyone – even the Queen. She soon gets her rabbit back and teaches the queen a lesson about love and sharing into the bargain. 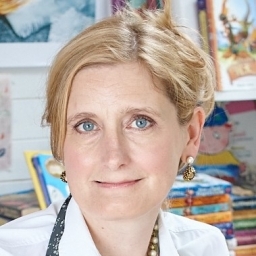 Best-selling Cressida Cowell adds a must-have new title to her series. All kinds of facts about dragons and their world and advice about how to manage the big creatures are included. The whole dragon world is brought gloriously to life in Cressida Cowell’s brand new colour illustrations. Hiccup Horrendous Haddock the Third is back for a rollicking new adventure. A Viking with a difference, Hiccup is a great swordsman and dragon whisperer but this time he’s got a dragon rebellion on his hands as well as trying to stop Alvin becoming the next King of the Wilderwest. It’s a lot for anyone to tackle and how this hilarious and delightful character achieves all he must is a delight. Hiccup’s previous adventures set the scene for this surprising and hilarious escapade in a glorious fantasy Viking world. Click here for all the info on the How to Train Your Dragon website including National Dragonese Day (6th October 2011). Hiccup the Hero has many attributes, including being a Dragon Whisperer. It’s a skill he learnt the hard way as these exploits reveal! Here also is an introduction to the key characteristics of the dragons and a Dragonese dictionary to help all future trainee Heroes. The Hiccup jokes continue to flow fast in this volume. Hiccup the great Viking hero was not always such a star. He makes a mistake in his first Boarding an Enemy Ship Lesson by tackling a Roman Dragon Rustling ship with the fearsome Alvin the Treacherous on board. When Toothless, the hero’s dragon, gets captured, Hiccup needs all his skills to get him back. How will he do so when Alvin steals his copy of How to Speak Dragonese? Jokes flow thick and fast from this most original and inventive Viking adventure, which launched the career of a Viking with a difference. Hiccup Horrendous Haddock grew up at a time of dragons but he was not always a hero. He had to learn to fight them. To do so he had to pass the Dragon Initiation Programme, an awesome schedule run by Gobber the Belch, idiot in charge of initiation on the Isle of Berk. Hiccup was by no means a natural high achiever when it came to dragon training but after many hilarious mishaps, he soon got the hang of it and was on the way to becoming a Hero. If you would prefer the edition with a film tie-in cover then click here. Jokes flow thick and fast from this most original and inventive Viking adventure, which launched the career of a Viking with a difference. Hiccup Horrendous Haddock grew up at a time of dragons but he was not always a hero. He had to learn to fight them. To do so he had to pass the Dragon Initiation Programme, an awesome schedule run by Gobber the Belch, idiot in charge of initiation on the Isle of Berk. Hiccup was by no means a natural high achiever when it came to dragon training but after many hilarious mishaps, he soon got the hang of it and was on the way to becoming a Hero. About the Film: This is the film tie-in version of How to train your Dragon and is therefore the perfect companion to the film, which is released in March 2010. It’s a major animated motion picture from Dreamworks, who created Shrek, Madagascar and Kung-Fu Panda. It's an adventure comedy set in the mythical world of burly Vikings and wild dragons and based on the book by Cressida Cowell. The story centres around a Viking teenager, who lives on the island of Berk, where fighting dragons is a way of life. Inititation is coming and this is his one chance to prove his worthiness to his tribe and his father. But when he encounters and ultimately befriends an injured dragon, his world is turned upside down. For lots of additional action and adventure with Hiccup why not also visit www.howtotrainyourdragonbooks.com. There are now eight books in the How to Train your Dragon series and they are published in over 30 languages. If you haven’t discovered Hiccup yet, you’re missing out on one of the greatest inventions of modern children’s literature. Hiccup, the Viking hero in the world of entertaining and unusual adventures, is back for a new set of adventures on the Pirate Training Programme. Still being trained by Gobbler the Belch, Hiccup learns new skills to help as he searches for Grimbeard the Ghastly’s treasure. Pirates and Vikings and treasure and dragons collide in a glorious romping adventure. Lovereading4kids adds: This is side-splittingly funny, wonderfully written and sure to appeal to children from about 8 upwards. It’s pirates with a big twist that includes a toothless dragon and a raft of peculiar people. Enough said, it’s a laugh on every page. Hiccup Horrendous Haddock 111, master of all things Heroic, has a load of new challenges to complete…Now he must complete the Impossible Task, save Fishlegs from being fed to the Beast to and discover the secret of the Lost Throne. It is a lot for one Hero. Luckily, Hiccup has just what it takes to solve all this and more – even if his methods are, as usual, a bit unorthodox. There’s a major animated film featuring Hiccup - How to train your Dragon - scheduled for March 2010 from Dreamworks. A World Book Day 'Recommended Read' for 2011 Hiccup the Hero is back with a new adventure. This time the Venomous Vorpent is his enemy and it has already struck Fishlegs with the deadly Vorpentitis. Hiccup must find a way of countering the creature’s deadly sting… Once again, Hiccup has to find some ingenious and hilarious ways of overcoming a lethal enemy if he is going to prove that he really is a Hero. Hiccup has a new set of challenges. This time he has to get back to Berk from America in record time, battle against the deadly Polarserpents and win the Inter-Tribal Friendly Swimming Race – which is not so friendly after all. Hiccup shows new talents not usually so necessary in a hero in this latest set of entertaining adventures. The Isle of Berk is under threat. Hiccup’s latest challenge is to stop the volcano from exploding …To do so he must rescue the Fire Egg which has been stolen and return it to the Volcano and outwit the sword-claws of the Exterminators. Plenty of new and hilarious predicaments for the great Viking Hero await the reader. Emily Brown and her old grey rabbit were an instant hit with children and parents everywhere when they burst onto the scene not long ago and won the 2006 Nestle prize. The book was called That Rabbit belongs to Emily Brown. Here is their second adventure and once again they save the day by making someone happy. More hilarious fun as Hiccup the Viking continues his pirate training programme enduring the disgusting food, learning dragonese and now getting lost in the Library Labyrinth with the Driller Dragons and Madguts the Murderous on the Prowl. Following both words and pictures creates a fabulous and fantastical words of dragons, Vikings and general chaos. Luckily, the inclusion of a dragonese dictionary means readers can make sense of it all. Just! Shortlisted for the Nestle Children's Award 2006 in the five and under category. Both author and illustrator are highly acclaimed in their own right and together in this absolutely exquisite picture they have surpassed even their own high expectations. Wonderfully imaginative with a subliminal message too that toddlers everywhere will thoroughly enjoy as will their parent. This is side-splittingly funny, wonderfully written and sure to appeal to children from about 8 upwards. It’s pirates with a big twist that includes a toothless dragon and a raft of peculiar people. Enough said, it’s a laugh on every page. An entertaining story which will strike a chord with all parents! How can the animals stop the Boo Hoo baby from crying? Feeding him helps, as does bathing him and playing with him but, in the end, bedtime is the only thing that will really stop him from crying. A wonderfully soothing ending to a great story. The No.1 Bestselling Series Enter a land of wizards, warriors, mythical creatures and powerful magic in an exciting fantasy adventure from the author of How To Train Your Dragon. Witches are creating havoc in the Wildwoods and danger lurks behind every tree trunk. Wish is in possession of a powerful, Magic Spelling Book; Xar has a dangerous Witchstain on his hand. Together they can save the Wildwoods from the curse of the Witches but they are separated by the highest wall imaginable, and time is running out ... It was unlikely that these heroes should meet in the first place. Is it possible they are destined to meet TWICE? 'The detail of Cowell's world is a delight ...This one will run and run' The Observer Discover the magic of Cressida Cowell. How to Train Your Dragon's Hiccup Horrendous Haddock the Third tells us everything you need to know about dragons... With exclusive collector cards! Long ago, the world was full of dragons. But what happened to them? Where are they now? These pages are taken from the notebooks of Viking Hero Hiccup Horrendous Haddock the Third when he was just a boy. A keen dragonwatcher, Hiccup paints a picture of the brilliance and fire and spirit of that lost dragon world. Featuring dragon profiles, dragon anatomy, dragon riding tips and lots more must know info e.g. how to spot the difference between an arsenic adderwing and a glow worm (you don't want to mix those two up) and what to do when confronted with a Hellsteether. This is a must for all keen dragonwatchers out there... How to Train Your Dragon is now a major DreamWorks franchise starring Gerard Butler, Cate Blanchett and Jonah Hill and the TV series, Riders of Berk, can be seen on CBeebies and Cartoon Network. Read all of Hiccup's exploits in the series: How to Train Your Dragon, How to Be a Pirate, How to Speak Dragonese, How to Cheat a Dragon's Curse, How to Twist a Dragon's Tale, A Hero's Guide to Deadly Dragons, How to Ride a Dragon's Storm, How to Break a Dragon's Heart, How to Steal a Dragon's Sword, How to Seize a Dragon's Jewel, How to Betray a Dragon's Hero and How to Fight a Dragon's Fury. Check out the brilliant website at www.howtotrainyourdragonbooks.com It's the place to go for games, downloads, activities and sneak peeks! An instant children's classic Cressida Cowell's What Shall We Do With The Boo-Hoo Baby? is a sturdy rhyming board book featuring a group of worried farmyard animals - all attempting to soothe and entertain the naughty boo-hoo baby. A perfect book for shared reading with the very young. Is there anything that will calm baby down? The story continues in the ninth volume of Hiccup's How to Train Your Dragon memoirs. Bad times have come to the Archipelago. Ever since the woods of Berserk burned down, it is almost as if the world is cursed. Dragons are starting to revolt against their Masters. The waters have risen, flooding fields and washing whole villages away. But worse still, the wicked witch Excellinor has returned. Can Hiccup find the King's Things and win the sword-fighting contest to stop Alvin the Treacherous from becoming King of the Wilderwest? How to Train Your Dragon is a DreamWorks film starring Gerrard Butler, America Ferrera and Jonah Hill, out on DVD adapted from the best selling How to Train Your Dragon series by Cressida Cowell. The rest of Hiccup's exploits are also available in audio, read by David tennant: How to Train Your Dragon, How to Be a Pirate, How to Speak Dragonese, How to Cheat a Dragon's Curse, How to Twist a Dragon's Tale, A Hero's Guide to Deadly Dragons, How to Ride a Dragon's Storm and How to Break a Dragon's Heart. WELCOME TO THE BOOK THAT STARTED IT ALL ... now a beautiful hardback with colour illustrations and all 48 collector cards. This gift book is a must-have for all How to Train Your Dragon fans. Hiccup Horrendous Haddock the Third is a smallish Viking with a longish name. The HAIRY HOOLIGAN TRIBE think he's totally useless, but Hiccup is about to face his destiny ... and one tiny dragon. Can he prove his worth and become a HERO, or will he be banished for ever? How to Train Your Dragon book is now a major DreamWorks film. READ ALL 12 BOOKS IN THE SERIES! You don't have to read the books in order, but if you want to, this is the right order: 1. How to Train Your Dragon 2. How to Be a Pirate 3. How to Speak Dragonese 4. How to Cheat a Dragon's Curse 5. How to Twist a Dragon's Tale 6. A Hero's Guide to Deadly Dragons 7. How to Ride a Dragon's Storm 8. How to Break a Dragon's Heart 9. How to Steal a Dragon's Sword 10. How to Seize a Dragon's Jewel 11. How to Betray a Dragon's Hero 12. How to Fight a Dragon's Fury How to Train Your Dragon is a major DreamWorks franchise starring Gerard Butler, Cate Blanchett and Jonah Hill and the TV series, Riders of Berk, can be seen on CBeebies and Cartoon Network. Written by Cressida Cowell, creator of the bestselling How to train Your Dragon series and with beautiful illustrations by Mark Nicholas, winner of the Carmelite Prize, comes a lyrical fable of a curious kitten who ventures out for the first time. 'One wild and windy night a stray cat called Tantrum O'Furrily and her three hungry kittens were dancing across the roof tops.' Tantrum O'Furrily's kittens are hungry and doubt that a story can ease a stray cat's rumbling stomach. They soon learn that stories are powerful, and that if you're courageous you might find a saucer of milk at the end of that story. 'One wild and windy night a stray cat called Tantrum O'Furrily and her three hungry kittens were dancing across the roof tops . . . ' Written by Cressida Cowell, creator of the bestselling How to Train Your Dragon series and with beautiful illustrations by Mark Nicholas, winner of the Carmelite Prize. Tantrum O'Furrily's kittens are hungry and doubt that a story can ease a stray cat's rumbling stomach. However, they soon learn that stories are powerful, and that if you're courageous you might find a saucer of milk at the end of that story. Ink-splattered and full of quotes, Viking songs and riotous drawings from the How to Train Your Dragon books. This is a must-have journal for all seasons with blank space for young Heroes to fill with their own dragon drawings and heroic musings... Also includes Dragon jokes and useful Dragonese phrases to help train even the naughtiest of dragons. How to Train Your Dragon is now a major DreamWorks franchise. How to Train Your Dragon 2 is the BIG Summer movie of 2014 starring Gerard Butler, Cate Blanchett and Jonah Hill and the TV series, Riders of Berk, can be seen on CBeebies and Cartoon Network. Read the rest of Hiccup's exploits in How to Train Your Dragon Books 1-11. Check out www.howtotrainyourdragonbooks.com for games, downloads, activities and sneak peeks! Read the HILARIOUS books that inspired the HOW TO TRAIN YOUR DRAGON films! Hiccup Horrendous Haddock the Third is a smallish Viking with a longish name. Hiccup's father is chief of the Hairy Hooligan tribe which means Hiccup is the Hope and the Heir to the Hairy Hooligan throne - but most of the time Hiccup feels like a very ordinary boy, finding it hard to be a Hero. High up in the treacherous mists of the Murderous Mountains, Hiccup and the Company of the Dragonmark are in hiding. The witch's Spydragons are guarding the shores of Tomorrow - but Hiccup is determined to become King of the Wilderwest. Can Hiccup dodge the dragons and steal the King's Things back from Alvin before the Doomsday of Yule? And is there a traitor in Hiccup's camp who in the end will betray them all? READ ALL 12 BOOKS IN THE SERIES! You don't have to read the books in order, but if you want to, this is the right order: 1. How to Train Your Dragon 2. How to Be a Pirate 3. How to Speak Dragonese 4. How to Cheat a Dragon's Curse 5. How to Twist a Dragon's Tale 6. A Hero's Guide to Deadly Dragons 7. How to Ride a Dragon's Storm 8. How to Break a Dragon's Heart 9. How to Steal a Dragon's Sword 10. How to Seize a Dragon's Jewel 11. How to Betray a Dragon's Hero 12. How to Fight a Dragon's Fury How to Train Your Dragon is now a major DreamWorks franchise starring Gerard Butler, Cate Blanchett and Jonah Hill and the TV series, Riders of Berk, can be seen on CBeebies and Cartoon Network. Read the HILARIOUS books that inspired the HOW TO TRAIN YOUR DRAGON films! Hiccup Horrendous Haddock the Third is a smallish Viking with a longish name. Hiccup's father is chief of the Hairy Hooligan tribe which means Hiccup is the Hope and the Heir to the Hairy Hooligan throne - but most of the time Hiccup feels like a very ordinary boy, finding it hard to be a Hero. When we last left Hiccup things were getting very dark indeed. The Dragon Rebellion has begun. Snotlout is the new Chief of the Hooligan Tribe. Stoick has been banished and given the Slavemark. And Alvin the Treacherous has EIGHT of the King's Lost Things, and has been proclaimed the new King of the Wilderwest ... But what can Hiccup do, now all alone and in exile, hunted by both humans and dragons? Can he find the Dragon Jewel, mankind's last and only hope and become the Hero once again? READ ALL 12 BOOKS IN THE SERIES! You don't have to read the books in order, but if you want to, this is the right order: 1. How to Train Your Dragon 2. How to Be a Pirate 3. How to Speak Dragonese 4. How to Cheat a Dragon's Curse 5. How to Twist a Dragon's Tale 6. A Hero's Guide to Deadly Dragons 7. How to Ride a Dragon's Storm 8. How to Break a Dragon's Heart 9. How to Steal a Dragon's Sword 10. How to Seize a Dragon's Jewel 11. How to Betray a Dragon's Hero 12. How to Fight a Dragon's Fury How to Train Your Dragon is now a major DreamWorks franchise starring Gerard Butler, Cate Blanchett and Jonah Hill and the TV series, Riders of Berk, can be seen on CBeebies and Cartoon Network. Read the original books before you see the How to Train Your Dragon film! This book will be a hit with children and adults alike. THE STORY BEGINS in the first volume of Hiccup's How to Train Your Dragon memoirs...Hiccup Horrendous Haddock III was an awesome sword-fighter, a dragon-whisperer and the greatest Viking Hero who ever lived. But it wasn't always like that. In fact, in the beginning, Hiccup Horrendous Haddock III was the most put upon Viking you'd ever seen. Not loud enough to make himself heard at dinner with his father, Stoick the Vast; not hard enough to beat his chief rival, Snotlout, at Bashyball, the number one school sport and CERTAINLY not stupid enough to go into a cave full of dragons to find a pet...It's time for Hiccup to learn how to be a Hero. How to Train Your Dragon is a DreamWorks film starring Gerrard Butler, America Ferrera and Jonah Hill, out on DVD in October 2010 adapted from the best selling How to Train Your Dragon series by Cressida Cowell Read the rest of Hiccup's exploits in the How to Train Your Dragon series in How to Be a Pirate, How to Speak Dragonese, How to Cheat a Dragon's Curse, How to Twist a Dragon's Tale, A Hero's Guide to Deadly Dragons, How to Ride a Dragon's Storm, and How to Break a Dragon's Heart. Check out the all-new Hiccup website at www.howtotrainyourdragonbooks.comIt's the place to go for games, downloads, activities and sneak peeks! Read all about Hiccup and all of your favourite characters, learn to speak Dragonese and train your own dragon to do tricks! Read the books that inspired the How to Train Your Dragon films. THE STORY CONTINUES in the eighth volume of Hiccup's How to Train Your Dragon memoirs... Hiccup Horrendous Haddock III was an awesome sword-fighter, a dragon-whisperer and the greatest Viking Hero who ever lived. But it wasn't always like that. Hiccup's memoirs look back to when Hiccup was just an ordinary boy, and finding it very hard to be a Hero. Hiccup must battle Berserks, dodge Scarers, complete the Impossible Task and save Fishlegs from being fed to the Beast! And all while being hunted down by an old enemy with a dark secret about the Lost Throne. What's a Hero to do? How to Train Your Dragon is soon to be a DreamWorks film starring Gerrard Butler, America Ferrera and Jonah Hill, out in March 2010 adapted from the best selling How to Train Your Dragon series by Cressida Cowell. Read the rest of Hiccup's exploits in the How to Train Your Dragon series in How to Train Your Dragon, How to Be a Pirate, How to Speak Dragonese, How to Cheat a Dragon's Curse, How to Twist a Dragon's Tale, A Hero's Guide to Deadly Dragons, and How to Ride a Dragon's Storm. Check out the all-new Hiccup website at www.howtotrainyourdragonbooks.com It's the place to go for games, downloads, activities and sneak peeks! Read all about Hiccup and all of your favourite characters, learn to speak Dragonese and train your own Dragon to do tricks! Listen to the books that inspired the How to Train Your Dragon films in the unabridged recordings narrated by David Tennant! This book will be a hit with children and adults alike. THE STORY CONTINUES in the fifth volume of Hiccup's How to Train Your Dragon memoirs ... Hiccup Horrendous Haddock III was an awesome sword-fighter, a dragon-whisperer and the greatest Viking Hero who ever lived. But it wasn't always like that. Hiccup's memoirs look back to when Hiccup was just an ordinary boy, and finding it very hard to be a Hero. Someone has stolen the Fire Egg. Now the Volcano on Volcano Island is active and the tremors are hatching the eggs of the Exterminator dragons! Can Hiccup return the Fire Egg to the Volcano, stop the Volcano from erupting, AND save the Tribes from being wiped out by the terrible sword-claws of the Exterminators? How to Train Your Dragon is now a major DreamWorks franchise starring Gerard Butler, Cate Blanchett and Jonah Hill and the TV series, Riders of Berk, can be seen on CBeebies and Cartoon Network. Read all of Hiccup's exploits in the series: How to Train Your Dragon, How to Be a Pirate, How to Speak Dragonese, How to Cheat a Dragon's Curse, How to Twist a Dragon's Tale, A Hero's Guide to Deadly Dragons, How to Ride a Dragon's Storm, How to Break a Dragon's Heart, How to Steal a Dragon's Sword, How to Seize a Dragon's Jewel and How to Betray a Dragon's Hero. Check out the brilliant website at www.howtotrainyourdragonbooks.com It's the place to go for games, downloads, activities and sneak peeks! THE STORY CONTINUES in the seventh volume of Hiccup's How to Train Your Dragon memoirs ... Hiccup Horrendous Haddock III was an awesome sword-fighter, a dragon-whisperer and the greatest Viking Hero who ever lived. But it wasn't always like that. Hiccup's memoirs look back to when Hiccup was just an ordinary boy, and finding it very hard to be a Hero. Hiccup has three months, five days and six hours to discover America, get back to Berk, save his father, battle Polarserpents, AND win the annual Inter-Tribal Friendly Swimming Race. Can he do it? (Tick-tock-tick-tock-tick-tock) How to Train Your Dragon is soon to be a DreamWorks film starring Gerrard Butler, America Ferrera and Jonah Hill, out in March 2010 adapted from the best-selling How to Train Your Dragon series by Cressida Cowell. Read the rest of Hiccup's exploits in the How to Train Your Dragon series in How to Train Your Dragon, How to Be a Pirate, How to Speak Dragonese, How to Cheat a Dragon's Curse, How to Twist a Dragon's Tale, A Hero's Guide to Deadly Dragons, and How to Break a Dragon's Heart. Check out the all-new Hiccup website at www.howtotrainyourdragonbooks.com It's the place to go for games, downloads, activities and sneak peeks! Read all about Hiccup and all of your favourite characters, learn to speak Dragonese and train your own dragon to do tricks! So begins Cressida Cowell's hilarious book about a little Viking who cannot fit in. Unlike his dad, Stoick the Vast, Hiccup is tiny, thoughtful and polite and scared of almost everything - especially of going to sea for the very first time. But go he must... So who will save the day when everything goes disgustingly wrong aboard ship and all the big Vikings lose their cool? This wonderfully witty fable will delight all those who have ever faced up to their worse fears. Read the original books before you see the How to Train Your Dragon film! THE STORY CONTINUES in the sixth volume of Hiccup's How to Train Your Dragon memoirs... Hiccup Horrendous Haddock III was an awesome sword-fighter, a dragon-whisperer and the greatest Viking Hero who ever lived. But it wasn't always like that. Hiccup's memoirs look back to when Hiccup was just an ordinary boy, and finding it very hard to be a Hero. Hiccup is lost in the Library Labyrinth and the Driller-Dragons and Madguts and Murderous are on the prowl. Hiccup's birthday is not going to be the quiet affair he might have hoped for. Also contains a comprehensive Dragonese Dictionary for those who'd like to dragon-whisper as well as the dragon-whisperer himself. How to Train Your Dragon is soon to be a DreamWorks film starring Gerrard Butler, America Ferrera and Jonah Hill, out in March 2010 adapted from the best selling How to Train Your Dragon series by Cressida Cowell. Read the rest of Hiccup's exploits in the How to Train Your Dragon series in How to Be a Pirate, How to Speak Dragonese, How to Cheat a Dragon's Curse, How to Twist a Dragon's Tale, A Hero's Guide to Deadly Dragons, How to Ride a Dragon's Storm, and How to Break a Dragon's Heart. Check out the all-new Hiccup website at www.howtotrainyourdragonbooks.com It's the place to go for games, downloads, activities and sneak peeks! Read all about Hiccup and all of your favourite characters, learn to speak Dragonese and train your own dragon to do tricks! Winner of the 2006 Nestle Gold Award, chosen for the Richard & Judy Christmas book party, a Bookaboo Book Club book as seen on CITV and read by Amanda Holden. When the Queen steals Emily Brown's favourite toy and erstwhile companion, a toy rabbit called Stanley, Emily sets out to get him back and teach that naughty queen a valuable lesson. This first time pairing of two highly acclaimed talents has created a brilliant visual feast - a bestseller in the making . . .
Read the original books before you see the How to Train Your Dragon film! THE STORY CONTINUES in the fifth volume of Hiccup's How to Train Your Dragon memoirs ... Hiccup Horrendous Haddock III was an awesome sword-fighter, a dragon-whisperer and the greatest Viking Hero who ever lived. But it wasn't always like that. Hiccup's memoirs look back to when Hiccup was just an ordinary boy, and finding it very hard to be a Hero. Someone has stolen the Fire Egg. Now the Volcano on Volcano Island is active and the tremors are hatching the eggs of the Exterminator dragons! Can Hiccup return the Fire Egg to the Volcano, stop the Volcano from erupting, AND save the Tribes from being wiped out by the terrible sword-claws of the Exterminators? How to Train Your Dragon is soon to be a DreamWorks film starring Gerrard Butler, America Ferrera and Jonah Hill, out in March 2010 adapted from the best selling How to Train Your Dragon series by Cressida Cowell. Read the rest of Hiccup's exploits in the How to Train Your Dragon series in How to Train Your Dragon, How to Be a Pirate, How to Speak Dragonese, How to Cheat a Dragon's Curse, A Hero's Guide to Deadly Dragons, How to Ride a Dragon's Storm, and How to Break a Dragon's Heart. Check out the all-new Hiccup website at www.howtotrainyourdragonbooks.com It's the place to go for games, downloads, activities and sneak peeks! Read all about Hiccup and all of your favourite characters, learn to speak Dragonese and train your own dragon to do tricks! Read the original books before you see the How to Train Your Dragon film! THE STORY CONTINUES in the fourth volume of Hiccup's How to Train Your Dragon memoirs ... Hiccup Horrendous Haddock III was an awesome sword-fighter, a dragon-whisperer and the greatest Viking Hero who ever lived. But it wasn't always like that. Hiccup's memoirs look back to when Hiccup was just an ordinary boy, and finding it very hard to be a Hero. Fishlegs has been struck with deadly Vorpentitis. The only cure is rare and almost impossible to find ... a potato. But where on Berk will Hiccup find such a thing? Hiccup will have to dodge Sharkworms, battle Doomfangs and outwit crazy Hooligans if he's going to be a Hero ... again. How to Train Your Dragon is soon to be a DreamWorks film starring Gerrard Butler, America Ferrera and Jonah Hill, out in March 2010 adapted from the best selling How to Train Your Dragon series by Cressida Cowell. Read the rest of Hiccup's exploits in the How to Train Your Dragon series in How to Train Your Dragon, How to Be a Pirate, How to Speak Dragonese, How to Twist a Dragon's Tale, A Hero's Guide to Deadly Dragons, How to Ride a Dragon's Storm, and How to Break a Dragon's Heart. Check out the all-new Hiccup website at www.howtotrainyourdragonbooks.com It's the place to go for games, downloads, activities and sneak peeks! Read all about Hiccup and all of your favourite characters, learn to speak Dragonese and train your own dragon to do tricks! Listen to the books that inspired the How to Train Your Dragon films! This book will be a hit with children and adults alike. THE STORY CONTINUES in the third volume of Hiccup's How to Train Your Dragon memoirs ... Haddock III was an awesome sword-fighter, a dragon-whisperer and the greatest Viking Hero who ever lived. But it wasn't always like that. Hiccup's memoirs look back to when Hiccup was just an ordinary boy, and finding it very hard to be a Hero. Climbing on to a Roman Dragon Rustling ship by mistake in your first 'Boarding an Enemy Ship' lesson is bad enough. But to then discover that Alvin the Treacherous is also on board proves to Hiccup he couldn't have been more wrong, especially when he steals his copy of How to Speak Dragonese. Can Hiccup save the dragons and the day? How to Train Your Dragon is now a major DreamWorks franchise starring Gerard Butler, Cate Blanchett and Jonah Hill and the TV series, Riders of Berk, can be seen on CBeebies and Cartoon Network. Read all of Hiccup's exploits in the series: How to Train Your Dragon, How to Be a Pirate, How to Speak Dragonese, How to Cheat a Dragon's Curse, How to Twist a Dragon's Tale, A Hero's Guide to Deadly Dragons, How to Ride a Dragon's Storm, How to Break a Dragon's Heart, How to Steal a Dragon's Sword, How to Seize a Dragon's Jewel and How to Betray a Dragon's Hero. Check out the brilliant website at www.howtotrainyourdragonbooks.com It's the place to go for games, downloads, activities and sneak peeks! Read the original books before you see the How to Train Your Dragon film! THE STORY CONTINUES in the third volume of Hiccup's How to Train Your Dragon memoirs ... Haddock III was an awesome sword-fighter, a dragon-whisperer and the greatest Viking Hero who ever lived. But it wasn't always like that. Hiccup's memoirs look back to when Hiccup was just an ordinary boy, and finding it very hard to be a Hero. Climbing on to a Roman Dragon Rustling ship by mistake in your first 'Boarding an Enemy Ship' lesson is bad enough. But to then discover that Alvin the Treacherous is also on board proves to Hiccup he couldn't have been more wrong, especially when he steals his copy of How to Speak Dragonese. Can Hiccup save the dragons and the day? How to Train Your Dragon is soon to be a DreamWorks film starring Gerrard Butler, America Ferrera and Jonah Hill, out in March 2010 adapted from the best selling How to Train Your Dragon series by Cressida Cowell. Read the rest of Hiccup's exploits in the How to Train Your Dragon series in How to Train Your Dragon, How to Be a Pirate, How to Cheat a Dragon's Curse, How to Twist a Dragon's Tale, A Hero's Guide to Deadly Dragons, How to Ride a Dragon's Storm, and How to Break a Dragon's Heart. Check out the all-new Hiccup website at www.howtotrainyourdragonbooks.com It's the place to go for games, downloads, activities and sneak peeks! Read all about Hiccup and all of your favourite characters, learn to speak Dragonese and train your own dragon to do tricks! Read the original books before you see the How to Train Your Dragon film! THE STORY CONTINUES in the second volume of Hiccup's How to Train Your Dragon memoirs ... Hiccup Horrendous Haddock III was an awesome sword-fighter, a dragon-whisperer and the greatest Viking Hero who ever lived. But it wasn't always like that. Hiccup's memoirs look back to when Hiccup was just an ordinary boy, and finding it very hard to be a Hero. Can Hiccup find Grimbeard the Ghastly's treasure before Alvin the Treacherous gets his sneaky hands on it? And if Hiccup opens a box that says DO NOT OPEN, will he live to tell the tale? How to Train Your Dragon is soon to be a DreamWorks film starring Gerrard Butler, America Ferrera and Jonah Hill, out in March 2010 adapted from the best selling How to Train Your Dragon series by Cressida Cowell. Read the rest of Hiccup's exploits in the How to Train Your Dragon series in How to Train Your Dragon, How to Speak Dragonese, How to Cheat a Dragon's Curse, How to Twist a Dragon's Tale, A Hero's Guide to Deadly Dragons, How to Ride a Dragon's Storm, and How to Break a Dragon's Heart. Check out the all-new Hiccup website at www.howtotrainyourdragonbooks.com It's the place to go for games, downloads, activities and sneak peeks! Read all about Hiccup and all of your favourite characters, learn to speak Dragonese and train your own Dragon to do tricks! Listen to the books that inspired the How to Train Your Dragon films! This book will be a hit with children and adults alike. THE STORY BEGINS in the first volume of Hiccup's How to Train Your Dragon memoirs... Hiccup Horrendous Haddock III was an awesome sword-fighter, a dragon-whisperer and the greatest Viking Hero who ever lived. But it wasn't always like that. In fact, in the beginning, Hiccup Horrendous Haddock III was the most put upon Viking you'd ever seen. Not loud enough to make himself heard at dinner with his father, Stoick the Vast; not hard enough to beat his chief rival, Snotlout, at Bashyball, the number one school sport and CERTAINLY not stupid enough to go into a cave full of dragons to find a pet... It's time for Hiccup to learn how to be a Hero. How to Train Your Dragon is now a major DreamWorks franchise starring Gerard Butler, Cate Blanchett and Jonah Hill and the TV series, Riders of Berk, can be seen on CBeebies and Cartoon Network. Read the original books before you see the How to Train Your Dragon film! THE STORY BEGINS in the first volume of Hiccup's How to Train Your Dragon memoirs... Hiccup Horrendous Haddock III was an awesome sword-fighter, a dragon-whisperer and the greatest Viking Hero who ever lived. But it wasn't always like that. In fact, in the beginning, Hiccup Horrendous Haddock III was the most put upon Viking you'd ever seen. Not loud enough to make himself heard at dinner with his father, Stoick the Vast; not hard enough to beat his chief rival, Snotlout, at Bashyball, the number one school sport and CERTAINLY not stupid enough to go into a cave full of dragons to find a pet... It's time for Hiccup to learn how to be a Hero. How to Train Your Dragon is soon to be a DreamWorks film starring Gerrard Butler, America Ferrera and Jonah Hill, out in March 2010 adapted from the best selling How to Train Your Dragon series by Cressida Cowell. Read the rest of Hiccup's exploits in the How to Train Your Dragon series in How to Be a Pirate, How to Speak Dragonese, How to Cheat a Dragon's Curse, How to Twist a Dragon's Tale, A Hero's Guide to Deadly Dragons, How to Ride a Dragon's Storm, and How to Break a Dragon's Heart. Check out the all-new Hiccup website at www.howtotrainyourdragonbooks.com It's the place to go for games, downloads, activities and sneak peeks! Read all about Hiccup and all of your favourite characters, learn to speak Dragonese and train your own dragon to do tricks!